Aluminum and iron fences have many differences between them, as both are different materials. Aluminum and iron fences can be compared on the basis of weight, strength, welding process, finishing and ease of installation. Both of the popular aluminum and iron materials have some advantages, and disadvantages as well. Aluminum has the advantage of maintenance freedom, whereas an iron fence needs regular care. An aluminum fence needs no painting, and can be left as it is, but a wrought iron fence needs to be painted, and must have a proper finishing afterwards. Aluminum fences are available in various colors, which can match the theme of your house. Iron fences are heavier and can manage rough wear and tear compared to aluminum, which is light weight and prone to denting or bending. Aluminum can be economical or expensive depending on quality, grade and requirements. In most cases, aluminum versus iron is cheaper and more affordable. A cast iron fence is no doubt stronger if the main concern is strength, because it lasts longer and is more durable. 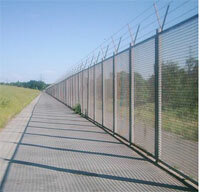 Whereas aluminum fences are easily damaged and not as heavy duty when compared to iron fences. Iron fences look more impressive and traditional compared to the contemporary looks of aluminum. One big drawback of aluminum fences is the installing process, which is difficult, and not possible without specialized tools and helpers. Iron fences are installed by hanging them on posts set in the ground. Aluminum fences need fence panels to be installed first. Yet they are flexible and easy to maintain afterwards. Iron fences have high production costs, and are not ideal for slanted landscapes; yet they are not gentle on small budgets when compared to aluminum. Aluminum fences are more appropriate for decorative and styling projects or purposes, whereas iron fences are used for strength and security purposes. Iron fences are commonly used for commercial applications compared to aluminum, since they are much stronger. Iron fences have various parts that are welded together, unlike aluminum fencing. 1. Aluminum and iron are both popular materials for fencing. 2. Aluminum is contemporary and maintained without any extra effort, whereas iron is a traditional material. 3. Iron fences are heavier, and various small or big parts are welded together, which give more security and strength. 4. Aluminum is more appropriate for decorative or house hold applications, whereas iron fences are used for commercial purposes. 5. Aluminum fences are cheaper and lighter than iron fences. Jilani. "Difference Between Aluminum and Iron Fences." DifferenceBetween.net. April 11, 2010 < http://www.differencebetween.net/miscellaneous/difference-between-aluminum-and-iron-fences/ >.